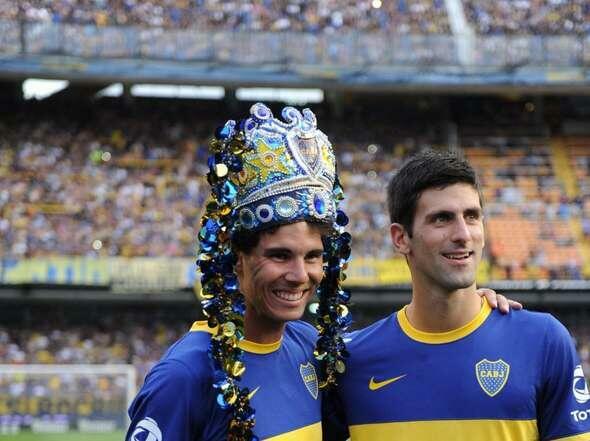 Reports recently circulated indicating that Rafael Nadal earned $10 million in fees for participating in exhibitions throughout South America during to the 2013 off-season. While the dollar figure hasn't been confirmed, the Nadal camp hasn't denied or corroborated the story. This story seemingly flies in the face of the swash-buckling, pirate pant wearing, narrative that was spun when Nadal first emerged as a future No.1 in the mid-aughts. Nadal was the island boy who enjoyed staying home and going fishing with his amigos. Times sure have changed! According to Forbes magazine, Rafa has earned $25 million from his off-court deals and activities. Rafa is repped by Carlos Costa, a former ATP player who earned 6 singles titles while on the tour. Carlos and Rafa initially joined forces around 2002 under the super-agency, IMG. Carlos also managed David Ferrer, but now concentrates solely on Nadal, "David Ferrer is still with IMG, but he is not with me any more, because if you are managing Rafa Nadal, you don't have any time to manage another top player," said Costa. Carols Costa departed from IMG at the end of 2012 and partnered with Rafa and his Rafa's father Sebastian to found HIS7ORY SPORTS MANAGEMENT. The agency doesn't have a website yet, but here's a link to some of their prototype stationery. After winning his record-7th Roland Garros Title in 2012, Rafa tweeted #HIS7STORY to his millions of followers. Costa reportedly signed Christian Garin, a junior Chilean tennis player, to the new agency. Around 2009, Rafa debuted the bull logo on his Nike apparel. The logo is now prominently featured on his Nike kits and on his website. Tennis sponsorship deals are usually broken down by category. A good agent is always looking for new, innovative deals to strike to expand a player's marketing portfolio. What sponsorship deals do you think are coming up next for Rafa?